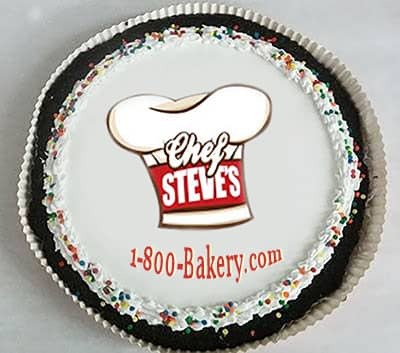 A classic double fudge brownie cookie cake baked fresh, then hand-iced and printed with your company logo and message. A rich double fudge brownie cake baked fresh from our classic recipe using the finest ingredients, then hand-iced by our artisans and printed with your company logo and message. Our full color, 100% edible ink lets you print any design directly onto the icing itself. Other bakeries commonly use edible paper, which we think leaves a funny texture and taste on the cake. This led us to develop our own printing process so that you can't taste a thing - just the delicious double fudge cookie cake! Need something special? Just fill out a Request Estimate form and one of our Gift Experts will get right back to you. We have years of experience delivering large orders of these customized brownie cakes for holiday gifting programs and events. We're happy to work with you on any special requests you might have, like inserting gift cards or marketing materials with your gift or shipping to multiple addresses across the country.